We have all heard that saying “I’ll sleep when I’m dead.” Let me tell you that whoever is responsible for popularizing that statement actually did the whole human race a pretty serious disservice. This may be obvious, but sleep is vital for the body to function. Do you ever have those nights where you’re laying in bed wishing, hoping, praying for sleep and it just won’t come? What is it keeping you awake? I went around asking this question to the ASC team and came away with a pretty good list: the fear of sleep paralysis (and aliens), cyclic worry, being too excited, reflecting, list making, and chronic pain. Do you fit into one of those categories? Maybe you fit into more than one? I certainly do. This subject hits pretty close to home for me, as anyone on the ASC team can vouch for because I often come in rubbing my eyes — I have trouble sleeping and trouble staying asleep. Often, I can to read myself into sweet, sweet slumber and other times I get a thought and can’t let it go so I have to act (last time that happened I rearranged my entire house, literally). I have been living with sleepless nights since I was a kid and along the way I have discovered some really wonderful herbal helpers. I’m happy to share those with you here. Let’s start here because it’s good to know what we’re working with. Our bodies rest, heal, and restore themselves during sleep. Getting a good night’s rest is vital to our health. If you stay up all night with your friends, how likely are you to be able to perform well at work the next day? Not very likely, right? Our brains spend all day pulling in information. They need a chance to rest the conscious mind and reorganize the information from the day. If you’re not getting enough sleep, your brain doesn’t get a chance to catch up with itself. It becomes overworked. It’s well documented that high school and college students are chronically under-rested and that when students increase their sleep – even by 15 minutes – their grades get better and their memorization skills increase. This means that those late night cram sessions actually aren’t helpful—get a good night’s sleep the night before your exam and maybe add some herbs for your brain clarity to your study routine. Studies show that poor sleep – not just no sleep – contributes to cardiovascular disease at a very high rate. Poor sleep is directly correlated to sugar metabolism issues, high blood pressure, stroke, cardiac arrest, and other cardiovascular issues. Considering that heart disease is a main cause of death in this country, this is kind of a big deal. This goes right along with the heart health and the metabolism. Our bodies rest and restore while we sleep and if your sleep cycle is consistently interrupted, your metabolism can be out of whack and you could start to put on some extra pounds. Everything from not releasing the appetite suppressing hormone to not properly storing or using carbohydrates in the body can be caused by lack of sleep. If heart health and weight gain don’t scare you into putting “getting a good night’s rest” at the top of your to-do list, maybe this will: beauty sleep. It’s a cute thing that fabulous people say in the movies, but it is so real. Bags under your eyes, wrinkles, redness and puffiness in your face, and early aging are all signs of sleep deprivation. Sleep now, my pretty. Our bodies restore when we’re asleep. That’s when we fight off disease and recuperate our strength to fight another day. Not getting enough rest can allow opportunistic diseases to take hold in the body that we would otherwise be able to fend off. This one is always a good first one to go to because it’s very gentle. If you just had a rough day or you have a knot in your stomach, chamomile is going to be your best friend. It’s also great for the kiddos — my grandma always had “sleepy-time tea” and would give it to us kids that would. not. sleep. It’s safe and gentle but powerful for enforcing bedtime. Here’s another familiar friend. Lavender can be used in a few different ways to help with sleep. For those that have a bit of worry or feel the need to make to-do lists before bed, smelling lavender essential oil can take your mind to a completely different place. A tea and maybe a foot bath will get you ready for bed. Mixed with chamomile, this one can put a kiddo to bed in 10 minutes, flat. Using lavender as a tincture along with vervain or mugwort can help relax your body enough to allow to trust enough to drift off. Probably the most common place you’ll find hops now is in beer. It’s there because of their calming effect. Back in ancient Rome, there was a traditional, feminine-led practice of brewing a beer-like beverage using mugwort. Unlike the beer we drink now, which is made with hops, this brew would keep people up all night in a euphoric state. The story of this practice and the eventual disappearance of it is pretty astounding. You can read more about that here. But back to hops. Hops is a wonderful peace inducing tea that will help you just sort of drift away without a care. One of my teachers told me a story of her days in herb school. Her professor had four shots of espresso on a red eye and by the time he had made it to class he was exhausted, jazzed on coffee, and anxious as all get out. He had my teacher pour him a shot of skullcap and he drank the whole thing. Within minutes he was calm, cool and collected. Not so bad. At this point you’re probably not surprised to see my good friend mugwort on this list because she somehow turns up on almost all of them. Sleeplessness is where my infatuation with this herb started because the folklore around our good friend is all about sleeping and dreaming. It’s that herb you turn to when going to sleep isn’t really a problem but your dreams are keeping you awake, or when you can’t stay asleep throughout the night. Vervain is my personal ally for those really tough nights… You know those ones where you’re awake because you can’t stop thinking about sleep and “everything else” is keeping you awake — your blanket isn’t right, it’s not dark enough outside, the cat is in the room, the dishes need to get done tomorrow — all those things. I like vervain mixed with mugwort and lavender for a triple whammy to help me drift pleasantly off to sleep, and stay there. It is wonderful at calming down those cyclic thoughts that just won’t go away, as well as easing tension. Do you have a fool-proof sleep remedy? Share it below! 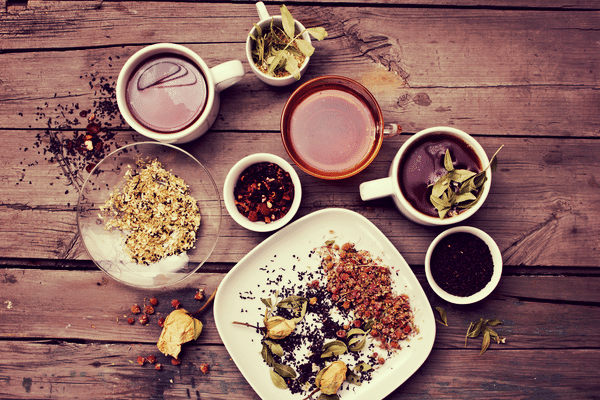 Do you take these herbs in tea form? If so, how much? Or do you take it in capsule form? You can certainly take them as a tea! It’s wonderful to wind down your evening with a cup of tea or two. I personally like to take my sleeping herbs in tincture form because the way that I have a hard time sleeping has more to do racing thoughts and taking a tincture works better for me in that case. It’s completely up to your body and what works best for you! Hi Dawn! There could be any number of reasons why you’re not getting good sleep and the herb blend that you choose should relate to why you’re not sleeping. Hops, skullcap, and vervain would make a really nice tea for before you go to bed if you’re wanting to wind down. Mugwort can lead to less sleep in people that are deprived of sleep in general because it can make you dream more and some people report that the intensity of their dreams is keeping them awake.